DECK-O-SHIELD PLUS is a premium-grade, ready-to-use, water-based sealer formulated for use on natural stone. DECK-O-SHIELD PLUS is formulated specifically to seal porous surfaces and is ideal to use on pool copings and decks protecting them from salt penetration. It can be used on all porous surfaces such as natural stone, tile, concrete, pavers, and grout. DECK-O-SHIELD PLUS provides a solution to spalling and pitting of porous stone and concrete surfaces caused by salt penetration as well as spalling caused by freeze-thaw cycles. DECK-O-SHIELD PLUS is a premium-grade, ready-to-use, water-based sealer formulated for use on natural stone. DECK-O-SHIELD PLUS is formulated specifically to seal porous surfaces and is ideal to use on pool copings and decks protecting them from salt penetration. It can be used on all porous surfaces such as natural stone, concrete, pavers, and grout. DECK-O-SHIELD PLUS provides a solution to spalling and pitting of porous stone and concrete surfaces caused by salt penetration as well as surface damage caused by freeze-thaw cycles. DECK-O-SHIELD PLUS repels water and protects virtually all porous surfaces, including decks, porches, patios, and walkways around pools. This includes the following surfaces: natural stone, mortar joint, concrete, brick, concrete block, stucco. Another advantage DECK-O-SHIELD PLUS provides is that the product will not alter the color or tint of the surface after application. There is no need for worry when applying DECK-O-SHIELD PLUS, because the product should have no adverse effects on surface appearance after application. DECK-O-SHIELD PLUS is not a film-forming material – it penetrates the surface to form an integral barrier to moisture penetration. High solids content; one-coat application on most surfaces. Helps protect against efflorescence and rust staining. Provides spill and wipe protection from stains. 300 – 475 ft.2/gal. (7.36 – 11.66 m2/L). Coverage rate will vary due to the porosity of the substrate. Complies with U.S. EPA, LADCO, and OTC VOC regulations. Treated surface is USDA accepted. Surface Preparation … Protect people, vehicles, property, plants, and all non-masonry surfaces from product, splash, residue, and wind drift. 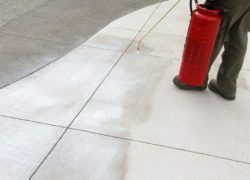 Concrete surface must be clean from all stains, oil, grease, dust, dirt, efflorescence, and curing compounds removed prior to application. Though DECK-O-SHIELD PLUS may be applied to slightly damp surfaces, best performance is achieved on a clean, thoroughly dried and absorbent surface. Excessive moisture inhibits penetration, reducing the service life and performance of the treatment. Always test for compatibility. Surface and Air Temperatures … The surface and air temperature should be between 40° to 95° F (4° to 35° C) during application and eight hours after. If freezing conditions exist before application, let surface to receive treatment thaw. The DECK-O-SHIELD PLUS water carrier may freeze at low temperatures or evaporate at high temperatures. Both conditions impair penetration and results. Application Method … Apply with a low-pressure airless sprayer, such as a Chapin 1949 with a 0.1 GPM (0.379 LPM) spray rate, paint roller or brush, allowing DECK-O-SHIELD PLUS to flood the surface. Roll or brush out puddles. Do not let the product puddle on the surface or dry on the surface. After 10 – 15 minutes, wipe the entire surface with a clean, dry cloth, removing all excess sealer from the surface. Two coats may be necessary on porous substrates. When applying these two coats, do not allow the first coat to fully dry before applying the second. Treated surfaces dry to touch in 1 – 2 hours. Protect surfaces from rainfall for six hours following treatment. Many surfaces need several days to develop optimum water repellency. For denser surfaces, use DECK-O-SHIELD. DO NOT DILUTE OR ALTER. MIX THOROUGHLY PRIOR TO USE. DO NOT FREEZE. Do not over apply. DECK-O-SHIELD PLUS is a water repellent, not a waterproofing or vapor barrier. DECK-O-SHIELD PLUS should not be applied to surfaces that are to receive caulks or sealants. Application over fully cured elastomeric sealants typically will not affect the sealant. Do not apply to surfaces with temperatures of <40° F (4.4° C) or >95° F (35° C). Prevent from being spilled or over sprayed onto nearby water sources. Temporary darkening of some substrates may occur. Surfaces treated with DECK-O-SHIELD PLUS may prevent adhesion of subsequent coatings. Apply a small test patch application prior to full-scale application. Refer to Safety Data Sheet for complete health and safety information.